The weddings of two sets of friends gave me the chance to go back to our former home recently. The first wedding was in early spring and the second was just last weekend. Both were absolutely lovely. The trips were completely jam-packed, but gave us the chance to celebrate and catch up with friends. The timing of the second trip even worked out perfectly so that we could meet the just-arrived baby of another set of friends. It was wonderful to get to be a part of so much happiness. As you might guess, there was a lot of eating and drinking to go with all of this merriment. I went to CA ahead of Greg on the first round and with my days in LA I decided to try to mix new and old favorites. 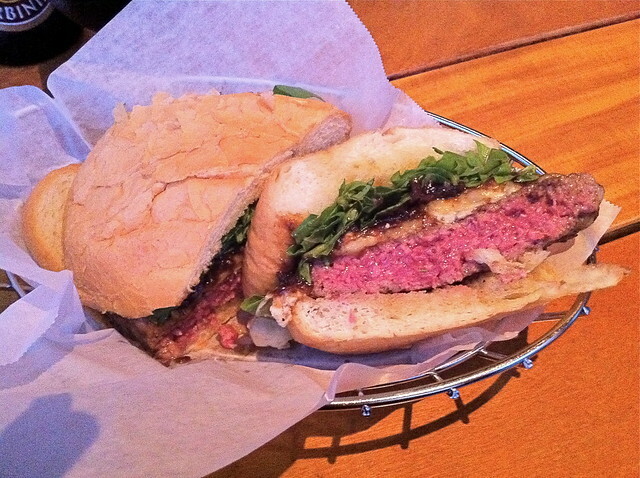 On the second trip, I gave Greg more sway over the picks, so there were a lot of burgers on the weekend’s menu. My first stop on the first trip was to meet friends for drinks and Mexican food at Loteria Grill in Hollywood. 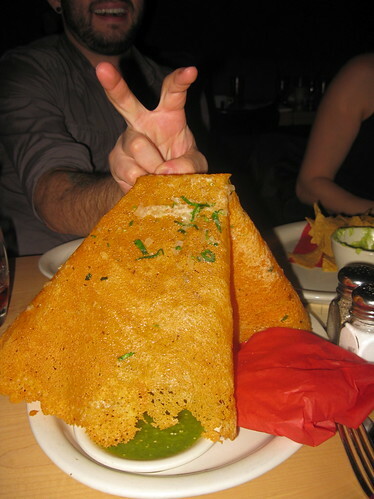 The chicharron de queso is an impressive appetizer, although its grandeur might be lessened by Marc's bunny ears. The Probaditas Sampler is my favorite plate. 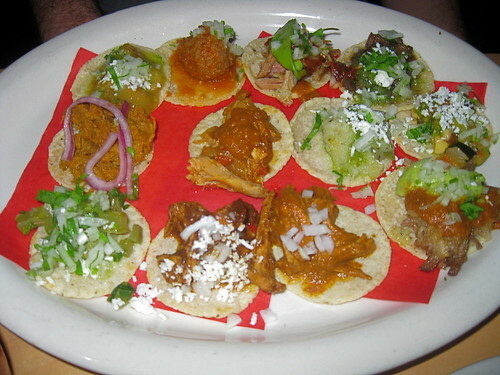 You get a small taste of each of the twelve taco varieties they offer. Marc an I took a little field trip to The Getty Center. 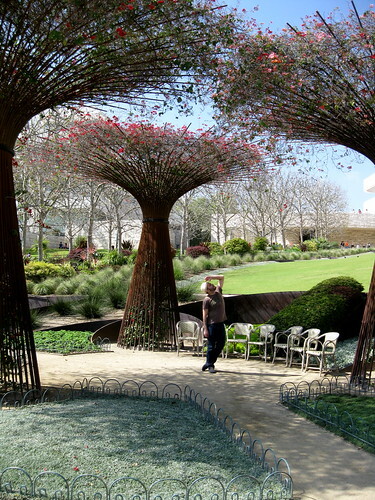 I'm not usually a big fan of their exhibitions, but architecture and gardens are gorgeous. The Restaurant did not disappoint either. 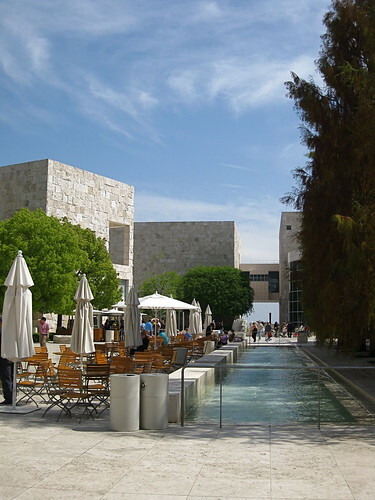 It is a modern and elegant space, with large windows and beautiful views. The Panzanella Salad was oddly lacking in bread, but the Pork Belly on Mushroom Polenta was delicious and the Butter Tart absolutely scrumptious. 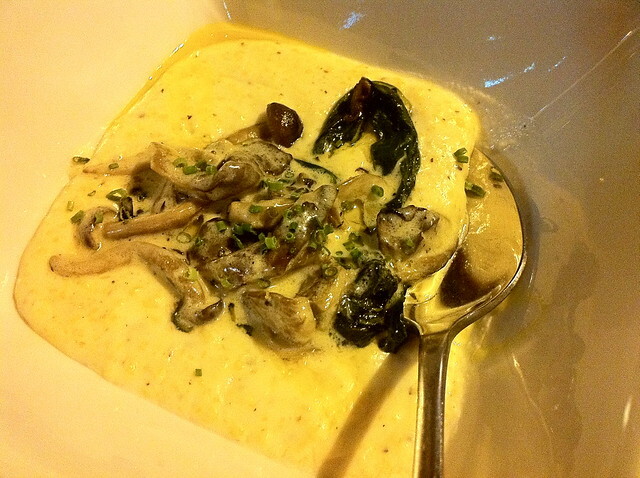 I had been wanting to try Jitlada Thai for ages and managed to organize a group dinner there. Jitlada doesn't normally take reservations, but I called and called, and once they realized that I wasn't going to leave them hanging, they were very kind and helped me out. You can see my pictures of dinner here, however, they've already taken pictures of almost every dish on the menu themselves and posted them online and they're much better than mine, as you'll see in their slideshow. I have to say, this is one restaurant that is very up on social media. Not only are they on flickr, but also Twitter and Facebook. You can link to all of them from their blog. All the organizing paid off -- this really was some of the best Thai food I've ever had. 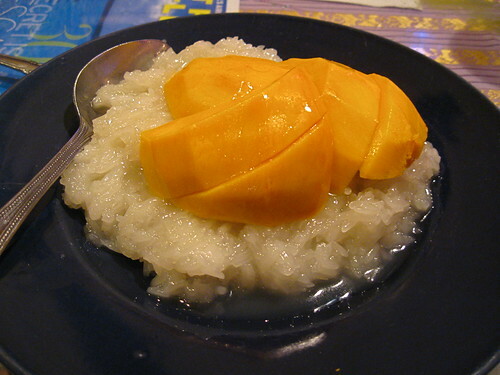 Marc insisted on having this Mango Sticky Rice for dessert and I'm glad he did because while it looks deceptively simple, it was sooooo good. 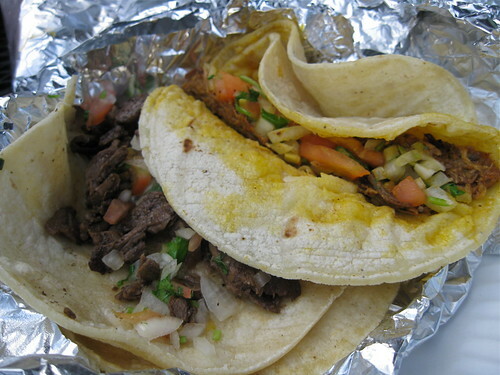 I was feeling Mexican food deprived, so my friend SB picked me and took me to Yuca's- my favorite LA taco stand. 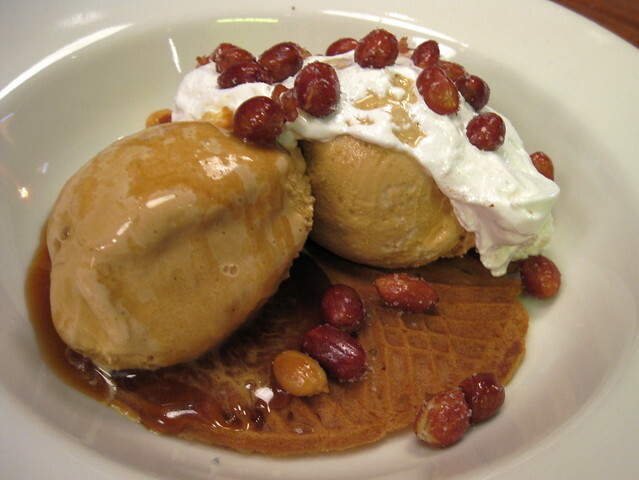 After I devoured my Carne Asada and Cochinita Pibil tacos, we hoped down the block for a little sweet treat at Gelato Bar. For my next dinner, I gathered a small group of friends at the Lazy Ox Canteen. This was only my second visit, but I don't think I've had a bad dish there. 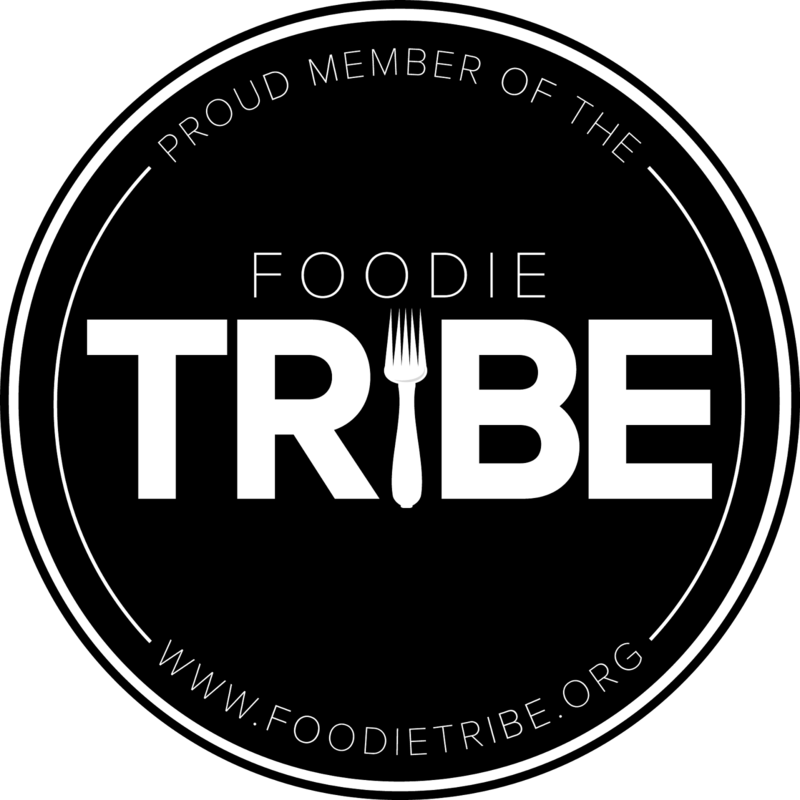 Their protein dishes are all very good, but I think they really work magic with vegetables. The kind of magic that involves a lot of butter and cream. Nonetheless, we ended up with more veggie dishes than anything else and I did not feel at all deprived. 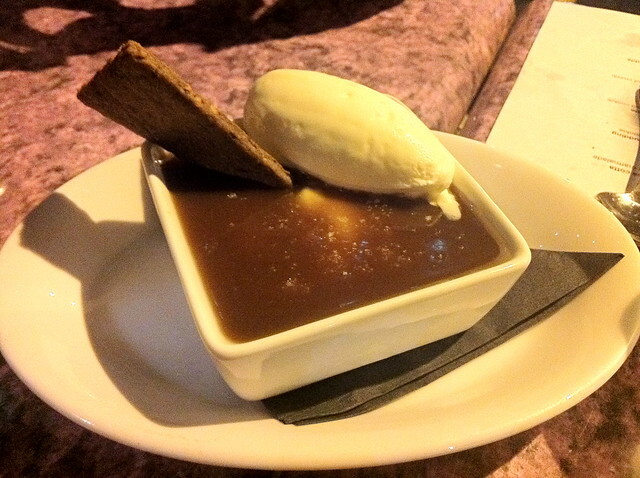 This Butterscotch Pudding had our small group swooning. 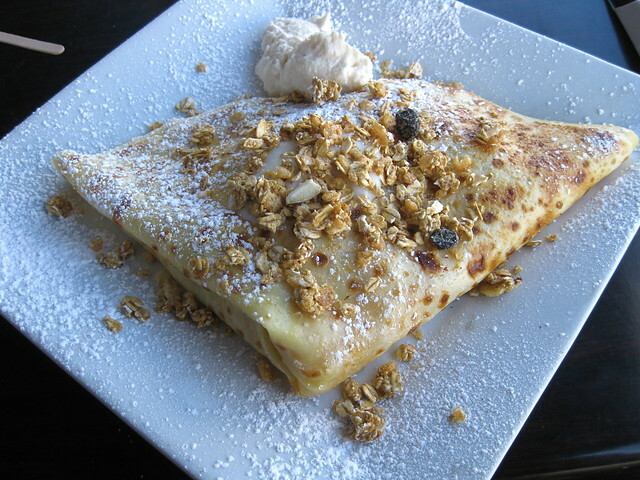 This lovely Energy Crepe at Solar de Cahuenga was my final meal from round one in LA. It looks over-the-top, but it's filled with apricots and yogurt, so it satisfies a sweet tooth without weighing you down. 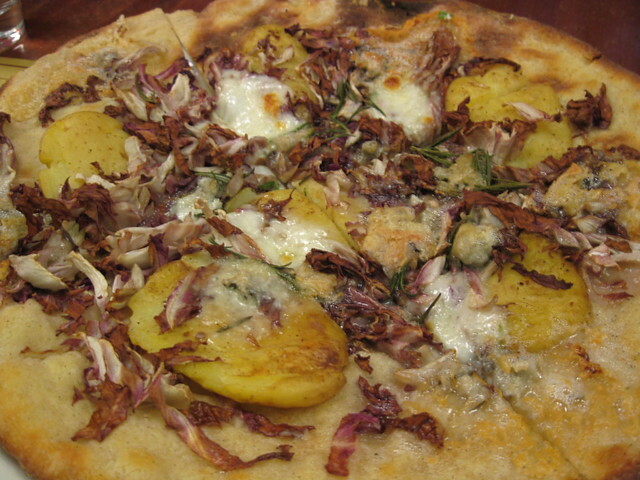 We were famished when we landed in Los Angles last Thursday, so we pretty much headed straight to lunch at Pizzeria Mozza. They have a wonderful deal when you sit at the bar. 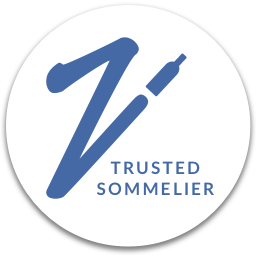 You can have your choice of pizza, a glass of wine, and a dessert all for $20. The pizza was good, but I was still dreaming about these desserts the next day. 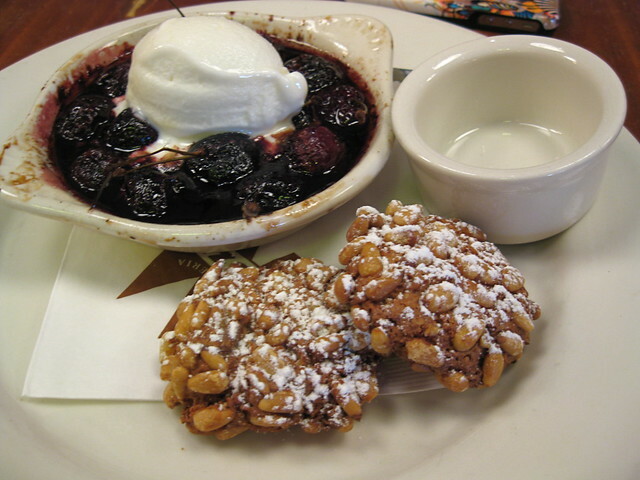 The Cherries al Forno were a bit tortuous though. They were amazingly delicious, but came out scalding hot. They were so good that it was hard to stay away and I kept burning my mouth. That night we had a little gathering at Father's Office. Getting a table took a small amount of scheming and wrestling, but we do so love those burgers. 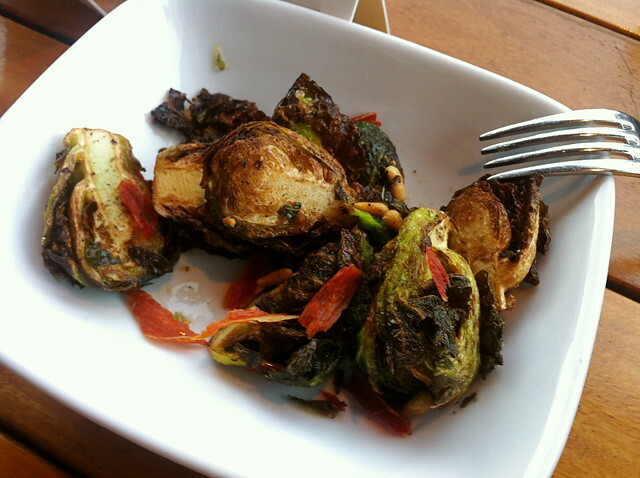 The Brussels Sprouts were also quite tasty. I have one small regret from this evening. A woman momentarily sat at our table as she waited for her to-go order. I didn't realize until after she'd left that it was Evan Kleiman, chef and host of my favorite radio food show, Good Food. 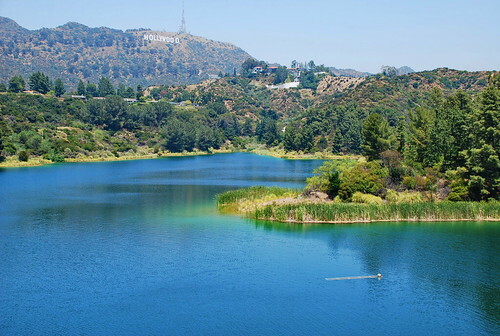 On Friday we made a vague attempt to combat the piling calories by hiking at Hollywood Reservoir. Marc introduced me to this beautiful spot during my last trip and Greg really wanted to see it as well. I doubt it made much of a dent, but the view is amazing. This picture was taken during the first trip and the one at top was taken last weekend. Notice how much the color has changed. Afterward, we grabbed lunch and beers at The Cat & Fiddle, which I believe has one of my favorite patio's in LA. 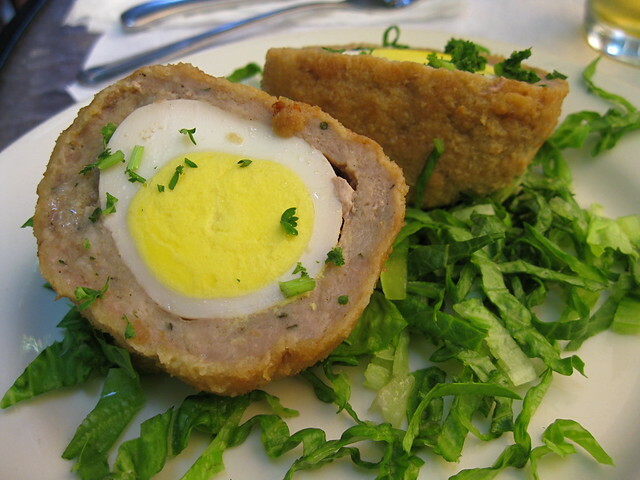 They serve pub food, including British classics like Scotch Eggs. I'm really not certain how I ended up with more burgers, but by some thought process I did order these Mediterranean Sliders. 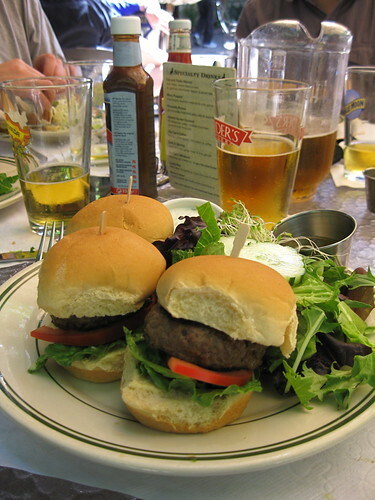 Whether it wise or not, the little sliders made with lamb went quite well with the beers and the sunny afternoon. 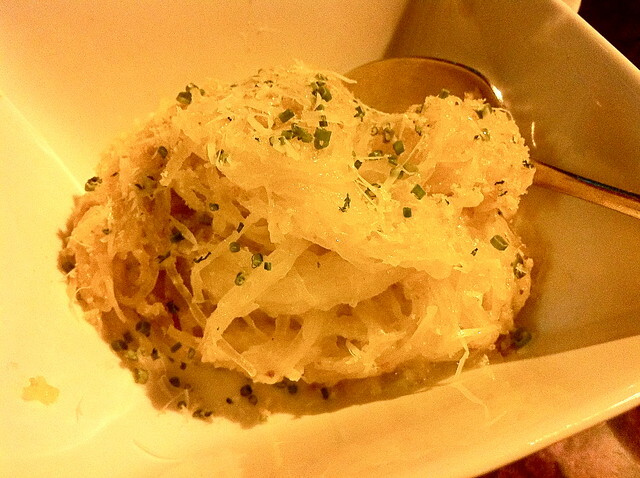 We had another indulgent dinner at A.O.C. with our hosts, Kim and Juan. 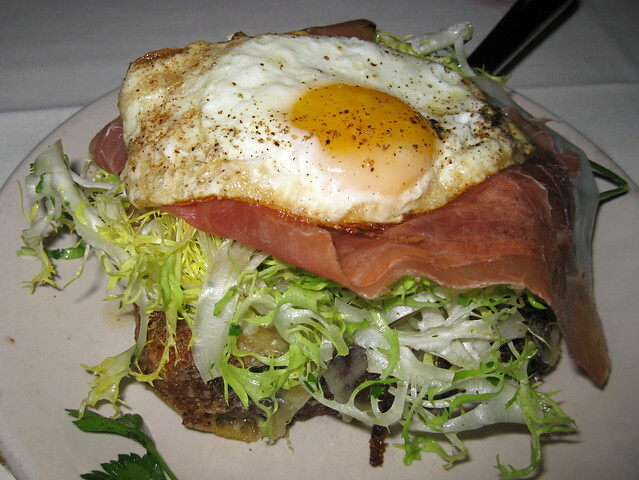 The brioche with prosciutto, gruyère and egg is one of my perennial favorites, however, it is very rich and we may have overdone it this time by ordering two. 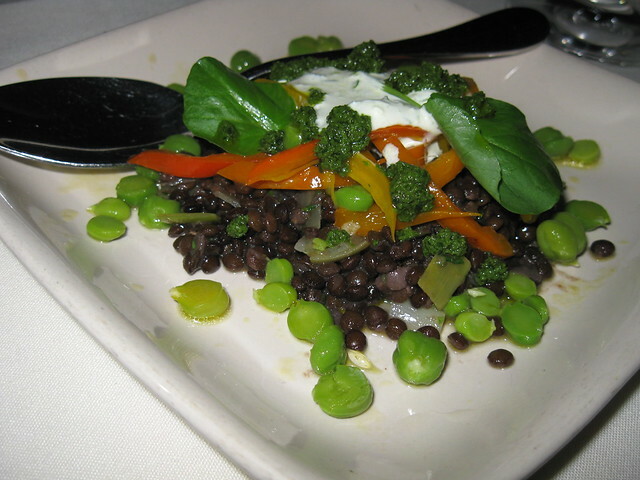 This salad of beluga lentils, fresh chickpeas, peppers, and labne was the surprise hit with everyone. It was light and full flavor -- perfect for summer. It was difficult, but an In-N-Out stop had to be made. And if it had to be done, well then, Animal Style is the only way to go. It may seem hard to believe, but hunger did actually manage to strike thanks to L.A.'s traffic -- one thing I definitely do not miss. The 405 held us up long enough to send my blood sugar plummeting. Kim had this stashed in her car and I took it down . . . with a tiny bit of help from Greg. Eventually, the 405 released us and we made it to our final destination for the trip -- a BBQ hosted for us by our friend Brian. And what do you think I had? Well, a burger of course. It was, however, a delicious one topped with seasoned tomatoes slices. That makes a burger a day for four days, on top of everything else! That's way more than I'm used to and you can bet that I've been eating quite virtuously this week to make up for it. I can't regret it though. 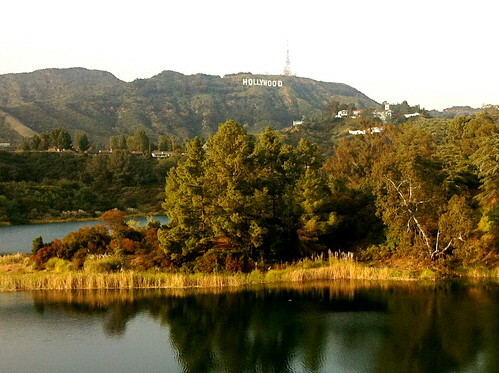 These were two delicious trips to Los Angeles. Many thanks to all of our friends who came out to hang with us despite having to deal with fitting large groups in small spaces. My apologies to our Supper Club friends for having to cancel thanks to the slow torture of traffic. We really missed seeing you and will make it up. Thank you so much to Brian and Kelli for hosting a BBQ in our honor and letting our friends take over their house and yard. Infinite thanks as well to Marc for hosting me in the spring, and to Kim and Juan for hosting both Greg and I last weekend. You all went above and beyond!